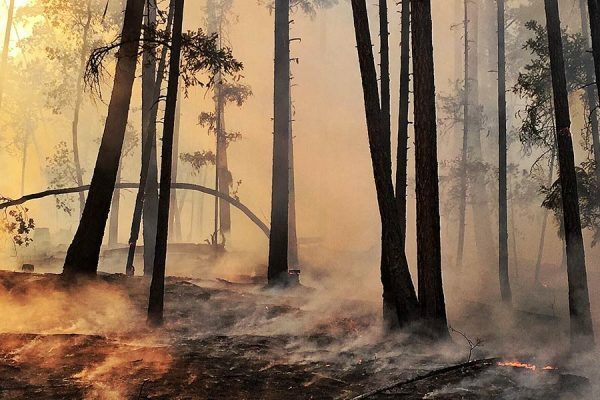 In the wake of the 2017 Wine County wildfires, Pepperwood's work has become more important than ever to help frame long-term, science-based solutions that make our communities more resilient in the face of future extreme events. As an organization dedicated to leveraging your philanthropy to advance conservation, we are deeply moved by your generosity and your dedication to ensuring Pepperwood continues its leadership role in Northern California's collective fire response and recovery efforts. The objective of our Fire Mitigation and Forest Health Initiative is to integrate multiple threads of Pepperwood’s applied science and management activities into one unified approach to forest health. Our goal is to demonstrate best practices on the preserve and to leverage Pepperwood’s role in research, outreach, collaborations, and technical advising to expand these throughout our region. From May 7-9, 2018, the Living with Fire in California’s Coast Ranges Symposium was held at Sonoma State University (SSU), in Rohnert Park, CA, as a partnership between the California Fire Science Consortium, Pepperwood, SSU, CAL FIRE, the Sonoma County Forest Conservation Working Group and local public and private agencies. Organized in response to the devastating October 2017 North Bay wildfires, the symposium brought together more than 400 participants, including members of the general public, scientific community, private sector, natural resource and fire safety agencies, and non-profit organizations. On December 4, 2017, Pepperwood hosted a half-day forum on Fire, Vegetation, and Resilience in the Mayacamas. Experts presenting included historical ecologist Arthur Dawson, fire ecologist Sasha Berleman, PhD, and forest ecologist David Ackerly, PhD Over 80 landowners, land managers, foresters, journalists, scientists, and members of the public attended. The talks put the October 2017 fires in scientific and historical context. Several presenters discussed the impact of the fires on lands they manage. The last presentation focused on how to effectively communicate to the public about the impact of the fires on natural lands. Pepperwood staff led a tour to review the impacts of the fires on our preserve. The day ended with focused discussion and prioritization among action options. In February of 2017, Pepperwood and the UC Berkeley Ackerly Lab hosted a workshop connecting our TBC3 science team directly with managers from local agencies, land trusts, and other groups. This workshop pioneered a scenario-based approach to adaptive management of our forests, and provided critical feedback needed to refine a set of Climate Ready tools produced in partnership with the Sonoma County Regional Climate Protection Authority to help managers better understand fire and drought risks to forest health in the face of a changing climate. The workshop also tapped into TBC3 models that project the potential declines of existing species and the potential arrivals of new species—both desirable and undesirable—on our lands. Pepperwood will provide ongoing support as science adviser to interested land managers through our Fire Mitigation and Forest Health Initiative network. In May of 2016, Pepperwood hosted a day-long invitational workshop to bridge from science to practice in managing North Coast range forest and chaparral ecosystems in the face of climate change and fire. Sixty-five scientists and land managers came together to share their expertise and create a framework for future collaboration around fire mitigation and forest health. The workshop was made possible by a cooperative agreement with the Bureau of Land Management focused on climate adaptation in our multi-jurisdictional landscape. Individual donors also provided critical match support via contributions to Pepperwood’s 2016 Fire Mitigation and Forest Health Initiative. In March 2017 Pepperwood released our peer-reviewed Adaptive Management Plan, a comprehensive guide detailing how we steward our landscapes, and how our management practices are informed by research conducted at our preserve. A large focus of the plan is on mitigating the risks of wildfire. Best practices outlined in the document are applicable to other open spaces throughout Northern California. A special thank you to the Gordon and Betty Moore Foundation and Pepperwood donors for supporting this monumental work. The Bureau of Land Management considered our May 20th, 2016 Workshop collaboration a big success! Read about it in a BLM News.Bytes article by Miriam Morrill, Climate Adaptation Planner, for the BLM California State Office. Guy Kovner and Alvin Jordana from the Santa Rosa Press Democrat covered Pepperwood's prescribed burn on June 10th, 2016. Read the story here. Get the latest update on Pepperwood's Fire Mitigation and Forest Health Initiative from our blog below. View materials from the 2018 Living with Fire symposium, including videos, proceedings, and full-length expert presentations on fire ecology, building home fire resilience, and more. Thank you for making Pepperwood's Fire Mitigation and Forest Health Initiative possible with your generous support! If you'd like to support this initiative, please make a tax-deductible donation using the link below.